Projected annual electrical net energy cost is $90 (plus service charges). A gas well is located on site, so projected annual heating and hot water cost of $803 may be zero. 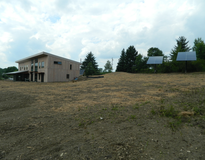 This new home is sited to maximize solar exposure and views, provide some earth sheltering, and allow safe movement in and out of the driveway. 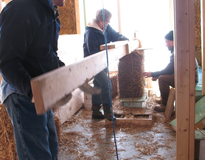 The super-insulated envelope consists of insulated concrete forms (ICFs), strawbale and structural insulated panel (SIP) balloon frame, and monolithic SIP roof. The main roof is a Living Roof over a rubber (EPDM) membrane. The low roof is corrugated metal. Windows are aluminum or fiberglass clad wood windows. 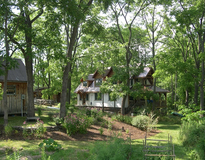 The strawbale walls have a coating of earthen plaster, covered by natural larch reverse board & batten siding. 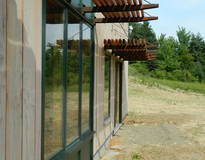 The exposed framing and sunscreens are comprised of reclaimed steel and wood. The form acts as a solar collector and the two-story central space acts to focus the plan and to facilitate natural ventilation and daylighting. 3D modeling enabled precise sizing of overhangs to minimize passive heating in the summer months. 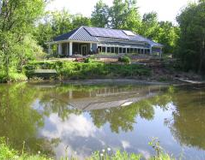 The site includes rainwater harvesting, rain gardens, well water and septic systems, a 5.52 kW ground mounted solar electric array, flat plate solar thermal units, indigenous vegetation, and a gabion retaining wall with reclaimed Jamestown brick cobbles. 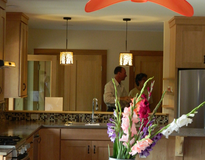 Natural finishes such as cork, linoleum, earthen plaster, and wood predominate. 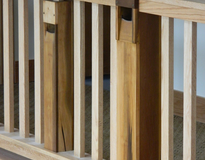 All are low or zero VOC and much of the wood is reclaimed from a former church in Buffalo. Even the pipe organ is represented in the newel posts of the balcony railing. Other finishes are reclaimed steel, rustic lumber and exposed polished concrete. The building systems include a massive 323 gal insulated tank which stores heated water for both heating and domestic use. A modulating condensing on-demand unit provides back-up heating for the solar thermal system. The exposed insulated concrete floor will absorb passive heat in the winter on sunny days. It also contains tubing for radiant heat distribution. A Heat Recovery Ventilator provides a constant source of fresh air for the home, which tested at approximately 2.0 ACH. With its open floor plan and ADA accessible downstairs; this home fosters interaction and conversation. It minimizes the footprint of the home while the access to the outdoors makes the home feel much larger. Attention to repurposing materials, energy conservation, and local sourcing throughout provides the opportunity for almost everyone to take home an idea for his/her personal use. 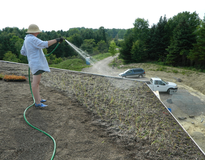 Attention was also paid to water retention, with the living roof, rain barrels and rain gardens. Natural wood siding and other exterior finishes expected to be maintenance free. Living Roof will require occasional weeding. This retirement home was envisioned to minimize energy costs, maximize interaction with the natural surroundings and develop expertise in the local contractor community to implement green building practices. If you don’t have experience with the systems, or time to attend to the details, it is imperative to have someone with experience, such as a natural building contractor, to provide ongoing recommendations. Between the Contractor and Natural Building Contractor, every day there were ideas to be weighed and opportunities to be taken. It made it a very rewarding experience.